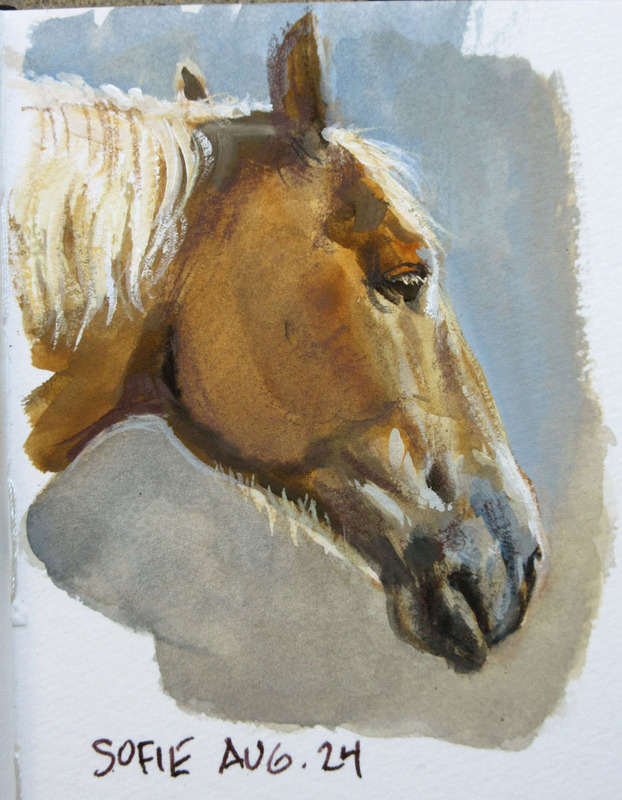 Yesterday at the barn I painted this portrait sketch of Sofie, one of the four Belgian draft horses. She had just gotten her shower in advance of her appearance today at the Dutchess County Fair. I used a limited palette of black, white, ultra blue, raw sienna, and yellow ochre. The image is the size of a playing card, about 3 x 3.5 inches. A very nice portrait. These draft horses are so beautiful. Was this done in the usual Moleskine? And gouache or casein? Hello James. Great painting. The horse really looks alive. Do you squint while you're looking at your subject like I read John Singer Sargent did? I read that Sargent always looked at his subject with squinted eyes, and only opened them fully when looking at his canvas, and that it helped him see the tones more accurately and also simplified his subject into larger masses with less detail. Do you use the squint technique all the time also? Robert, I think I do the squint thing unconsciously, but I find that all I have to do is leave off my reading glasses and get the same effect. Urban, I painted this in a Pentalic watercolor sketchbook. Casein would have worked fine, too. Very nice. I just started painting animals plein air and my first attempt was just bad. Really enjoy your blog.